Even with the little cool down we have had this past week, spring flowers are still showing up. The azaleas are really budding out, and it will be a very early season for them. 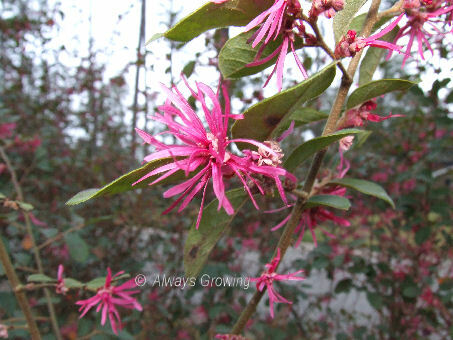 One flowering shrub that is starting to begin its springtime show is the lorepetalum. The raspberry-colored fringe flowers are brightening up the gray skies we have had the last few days. While many flowers have burst out, it will be about another five days or so before these shrubs are covered in blooms. They make a very nice complement to the azaleas. When this time of year comes, I wish I would have planted more of these blooming beauties. They certainly are a very pretty flower. Great form and lovely colour.